3 Must-Try Healthy Winter Comfort Food Recipes! Think cleaning up your diet means pushing the comfort foods aside and turning to tilapia and broccoli? Think again! Enjoy these flavorful, hearty meals this winter without derailing your fitness goals! Cold weather makes it more tempting than ever to curl up with a warm, inviting bowl of your favorite comfort food. Unfortunately, the best winter foods are not usually low in calories, and one bite of tasty goodness can throw your macros completely out of whack! You're left with a choice of suffering through chilly temperatures with your standard lean-and-mean meals, or getting creative with your favorite dishes. 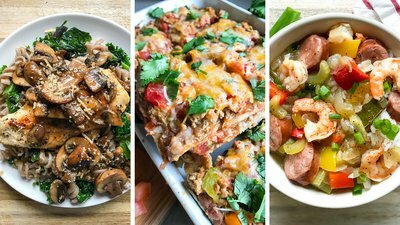 Here are three warm, winter recipes that make it possible to stay on track while indulging in rich and delicious meals. With lean proteins, healthy carbs, and a delicious variety of flavors to satisfy anyone's taste buds, you can enjoy the cold weather and still look forward to hitting your goals by spring! This Creole-inspired dish is loaded with andouille sausage, plump shrimp, onion, peppers, and okra in a flavorful onion broth with a hint of tomato and just a little heat. I've heard that Creole is "city" food and Cajun is "country" food...but I've also read that Creole food uses tomatoes and Cajun does not. Perhaps someone who knows a thing or two about southern cooking can set the record straight! At any rate, this delicious take on traditional gumbo is higher in protein, lower in fat, and lower in sodium than the traditional dish, while still offering plenty of deep-south-comfort-food flavor. Note: Leftovers can be kept in the fridge up to one week or in the freezer up to one month. This delicious twist on a classic casserole is layered like lasagna, using gluten-free corn tortillas instead of noodles, and salsa instead of marinara sauce. Enjoy all your favorite south-of-the-border flavors by topping this delicious taco treat with diced tomatoes, shredded lettuce, black olives, and nonfat plain Greek yogurt (It tastes just like sour cream!). For a low-fat, high-protein boost, this recipe calls for 93-percent-lean ground turkey, but you can substitute lean ground beef, shredded chicken, or black beans for a yummy vegan version—just remember to swap out the cheese for shredded vegan cheese. Note: Leftovers can be stored in the fridge up to one week or in the freezer up to one month. Although my childhood favorite is chicken alfredo, my favorite "grown-up" Italian dish is chicken marsala. I almost always order this dish when we go out for Italian—which is often since my husband is part Italian! Chicken Marsala is definitely a comfort food—there's just something about that rich wine sauce, tender chicken, and mushrooms! This lighter, healthier version still has all the delicious flavor of my favorite dish, and whether you're into traditional Italian or trying out new flavors, I'm sure you'll love it! Note: Leftovers will keep in the fridge up to one week.